Extremist militants and other fighters tied to the terror group al Qaeda have continued to gain a foothold in key sections of Syria as the country’s civil war rages on. Lawlessness has taken hold in many areas that are home to Syria’s biological weapons research hubs and mounting evidence indicates that al Qaeda fighters have capitalized on this security gap by looting the facilities. “The Syrian civil war has left sections of the bio-pharmaceutical infrastructure destroyed and looting of labs has been observed, which could indicate that Assad is losing command and control over one of the most dangerous classes of weapons remaining in his weapons of mass destruction (WMD) arsenal,” bio warfare and terrorism experts Jill Bellamy van Aalst and Olivier Guitta conclude in a new report. Syrian President Bashar al-Assad is believed to have ample biological weapons stores in addition to the chemical weapons currently being confiscated by Western nations. These caches likely include various neurotoxins and deadly viruses, according to U.S. intelligence estimates and other experts. “A very credible source has confirmed he saw, near Aleppo, a looted pharmaceutical laboratory, which was probably a cover for a biological weapons production site,” Guitta and van Aalst revealed in a research brief published by the Henry Jackson Society. The most recent looting took place in the embattled city of Aleppo, where the al Qaeda-backed group Al Nusrah is known to operate, according to the report. Guitta and van Aalst go on to warn that Assad’s supply of biological weapons are just as dangerous as his chemical arms, particularly if they fall into the hands of terrorist forces. Recent reports from Syria suggest that al Qaeda’s top leaders have taken an interest in Assad’s bioweapons research facilities. Suffaat is a graduate of California State University, Sacramento, where he received a degree in biology, according to Guitta and van Aalst. Syria’s biological weapons are particularly vulnerable due to the dispersed and highly clandestine nature of the research program, according to the report. Osama bin Laden was known to be very interested in obtaining and using chemical weapons. “It is a religious duty to have them; how we will use them? It is our business,” he was quoted as saying in 1998. The Pentagon later revealed in 2004 that al Qaeda has a relatively sophisticated bioweapons research effort underway, the report notes. Sen. John Cornyn (R., Texas) warned last month that Syria’s unsecured bioweapons pose a great threat to the region. U.S. intelligence agencies have reported that Assad possesses various biological weapons and has an active research program underway. 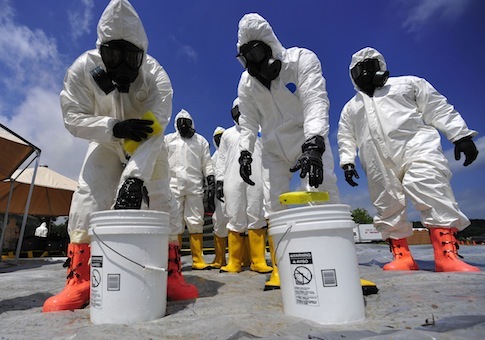 Biological weapons could more easily be obtained and used by terrorist forces, experts warned.